Horizontal Wedge Crystal Awards feature a simplistic design that offers ample area for personalization. 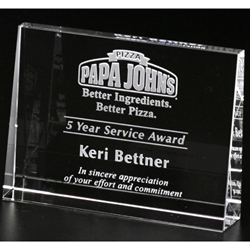 Consider using this flawless award to honor retirement, years of service, sales performance or employee commitment. Each award is made of optical crystal. Small: 4.75" wide x 3.5" tall x 1" deep; 1.5 lbs. Large: 6" wide x 4" tall x 1.125" deep; 2.5 lbs. Price includes your logo (if applicable) and 60 FREE characters of engraving in one location, a FREE proof, and a FREE black gift box for your award. Additional engraving areas and other personalization options like adding color (see picture 2) available at additional cost. Item Size 4.75" or 6"